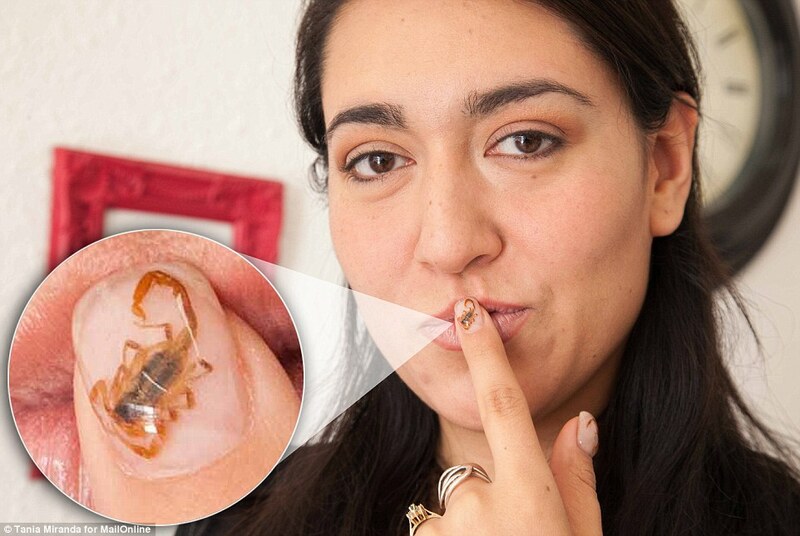 It's the latest and most bizarre beauty craze sweeping Latin America - women gluing dead scorpions to their finger nails. The new manicure style sees women attach scorpions to their nails with a venom so deadly it kills victims in 15 minutes, all in the name of fashion. The trend started in September when Lupita Garcia, a scorpion artisan and enthusiast, suggested to the staff at Rocío’s nail parlour in Durango, Mexico, to have a Scorpion-themed manicure. The tiny scorpions are stuck onto women’s nails, despite being less than a week old, are still highly venomous. The insects are killed with bug spray before they go near the manicurist’s table, and while the stingers are left on, Rocío says she never touches the animals with her hands. ‘It looks good, but I certainly wouldn’t have it done to my own nails,' said Sylvia Ruedas, having her manicure alongside Lupita. A video of the new manicure went viral after it was uploaded to Facebook - bringing comments in praise and disgust in equal measure. ‘A lot of people wrote saying how disgusting it was. But a lot Mexican-American women with roots in Durango have come specifically for the new manicure' said Rocío. Lupita’s passion for the deadly insects, the second most venomous scorpion in Mexico, has survived three separate trips to the emergency room. ‘I’ve been stung enough to know that the pain of the venom is very intense’, she said, recounting her experiences. ‘It gives you a terrible headache, your nose begins to bleed, your tongue goes numb and your throat feels like it’s lined with fur. Although they grow to just 4cm in length, the venom from Centruroides Suffusus can kill an adult human in 15 to 20 minutes. More than a thousand people were killed in Durango state in northern Mexico by the deadly insects last year. ‘Fatalities have been reduced significantly by the anti-venom units installed in every hospital, but it’s the people in rural areas who can’t get to a hospital quickly enough that tend to die,' Lupita said. The scorpion manicure involves sticking the dead insect to the nail before encasing it in liquid acrylic, which is subsequently polished. ‘Designing the manicure was tricky,' Rocío told MailOnline. ‘It was a challenge not to allow the insect to move, change colour or rot if exposed to the air. The popularity of the lethal scorpions, which are commonly found hiding under bus benches in Durango, has not been limited to the city’s beauty parlours. Dead scorpions, preserved in alcohol, are available for £2 each in the local market, fished out of jars containing more than 1,000 insects. Scorpions are even sold in tacos to eat at the city centre’s Raíces restaurant. The scorpions served in Sergio’s tacos are soaked in surgical alcohol for 24 hours before they go near the kitchen, a process which the owner claims neutralises the asphyxiating venom. ‘We make sure they completely safe to eat before we cook them’, he said, ‘that’s why we leave the stinger on, it gives the insect that extra bite on your tongue when you bite into it’. Dr Ramirez added: ‘The alcohol destroys the functionality of the venom-producing organ. They’re perfectly safe to eat, although still not particularly delicious’. ‘It’s popular because it’s such a novelty, not because it’s delicious.' said Erica Mendez from Sinaloa. 'It’s more like chewing stringy cartilage. ‘I certainly wouldn’t choose scorpions tacos over enchiladas in the future’. Sergio Ávila, the scorpion taco’s inventor, added: ‘I used to play with the scorpions on the mountainsides as a kid. The reality is that Sergio’s insects taste of very little, and given their hard exoskeleton are difficult to chew. The restaurant serves variations of the fried bug by coating them either in chocolate, chilli powder or tequila, and offering them still alive to those who have consumed enough alcohol to dare. ‘The scorpions have claimed a lot of lives throughout the region, so it’s understandable that they have come to represent Durango,' said Socorro Orijin, 76, who sells clocks, key rings, fridge magnets and mugs containing dead scorpions. ‘A lot of people have been murdered using these scorpions. Lupita, who says her alternative manicures have helped to attract more business to her stall, added: ‘We sell live scorpions to people as pets, but we always cut off the stinger.